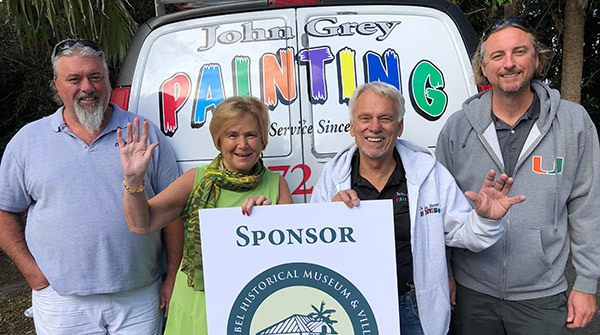 January 24, 2019 – The Sanibel Historical Village has recently announced that John Grey Painting will be a silver sponsor of its February 19, 2019, Historical Village Gala. The theme of the gala is “An Evening on the Old Algiers,” and it will be held at the Community House from 6 to 10 p.m. The gala will include a buffet dinner and dancing, as well as opportunities to learn about the fascinating history of the glamorous Algiers river boat that once sat on the beaches of Sanibel. Tickets to the gala can be purchased online at sanibelmuseum.org or by calling (239) 472-4648. So far, this year’s sponsors include: Allegra Printing, Times of the Islands, John Grey Painting, Sanibel Captiva Beach Resorts, Bank of the Islands, VIP Realty, the Island Sun, Sanibel Catering by Bailey’s, and Sanibel Captiva Trust Co. Individual sponsors include: William and Gail Bachman, Liz Clark, Dorothy Donaldson and Aaron Cohen, Ralph and Billye Curtis, Garlinghouse Foundation, Neal and Sherry Halleran, Pete and Jan Halliday, John and Jane Henshaw, Robert and Jane Holder and Sheila Barboza, Friedrich and Daniela Jaeger, Karl and Jeri Magg, Edward and Dorothy Miller, Kevin and Deirdre O’Donnell, William and Stephanie Rahe, Ron and Faith Souders, Davis and Patricia Thurber, Rod and Gerry Verblaauw, and Alex Werner and Karen Storjohann, and Larry and Judy Yenkole.